FABA is pleased to announce a new program for parents to reduce the cost of baseball. This program is called "Erase Your Fee", and it lets parents sell extra fund raising items to reduce their registration fee for FABA. Here is how it works. FABA will still require that all players sell three mandatory fundraising items, but every item sold after the third will go toward erasing the registration fee. For each additional fund raising item sold, the fee will be reduced by $10. The additional 4 will take $40 off of the registration fee. Players may sell enough items to reduce their fee completely, and any items sold after that go to FABA's fundraising effort. For all except Babe Ruth players, the deadline for selling items to Erase Your Fee is April 26th. For Babe Ruth players, it is May 3rd. After each deadline, our treasurer will adjust fees based on items sold and process refunds for those who have already paid. It is our way of saying "Thank You" for choosing FABA. Fundraising materials should be ready in a few weeks, and we'll be distributing them at the Winter Clinics, so you'll have plenty of time to sell before the season begins. We are excited about Erase Your Fee and the opportunity it gives to parents to reduce the cost of baseball for their players. If you have any questions about the program, please contact the FABA board atboard@fleetwoodbaseball.org. Why is only a portion of the money received from extra fundraising going toward reducing our registration fees? Why not all of it? Does FABA make a profit from registration fees? How will I receive funds from Erase Your Fee? What if my player sells more fundraising than is required to erase his/her fee? Why did the Sr. Babe Ruth registration fee increase so much from last year? FABA relies on fundraising revenue to operate. Last year, many of our excellent players and parents sold more than the mandatory 3 items, and this additional revenue was essential in doing things such as providing new equipment and improving and maintaining fields. 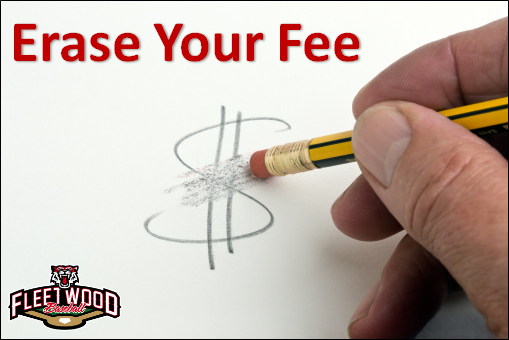 The board wanted to enact Erase Your Fee without sacrificing this much needed revenue to the organization. We modeled out a few ways to allocate the funds from additional fundraising to ensure that we could provide Erase Your Fee while keeping our budget safe at the same time. In the end, the $10 credit made the most sense. FABA does not make a profit from registration fees. We budget each division's costs such as uniforms, umpire fees, insurance, etc. and try to ensure that registration fees cover them. The deadline for selling items to Erase Your Fee is April 26th, 2019 for all players except Babe Ruth players, For Babe Ruth, the fundraising deadline is May 3rd. After each deadline, our treasurer will adjust fees based on items sold and send refund checks to those who have already paid. Your fee will be reduced to zero and any additional fundraising revenue will go to FABA. Our costs for Sr. Babe Ruth will be higher this coming season. Here is why. Our Sr. Babe Ruth teams will be participating in the Chesmont league this coming Spring/Summer. The Chesmont league includes teams from Boyertown, Norchester, Daniel Boone, Exeter and other areas to our south. Unlike our usual in-house seasons which have 10-13 games, the Chesmont league has an 18 game season plus playoffs and an all-star game. More games means more umpire fees, and the umpires for this league are a bit more expensive. Chesmont also charges more for teams to enter the league. We decided to go with the Chesmont league for several reasons. First, opportunities for 15-17 year old teams in our area are scarce, and Chesmont has been catering to this age group for some time now. Second, the Chesmont organization provides our players with a good range of competition with excellent teams and good competitive play. Finally, Chesmont is a well run league with good communication and excellent officials. In the end, we felt that this was the best option for our players in that age group. We will also be providing our Senior Babe Ruth players with tournament team quality uniforms rather than our usual shirt and pants.